I am always on the lookout for new and different places to visit, and I come upon different ideas for travel destinations in many different ways. Some destinations are well known throughout the world. Some are recommended to me by fellow travelers. Some I discover through reading, TV or the Internet. 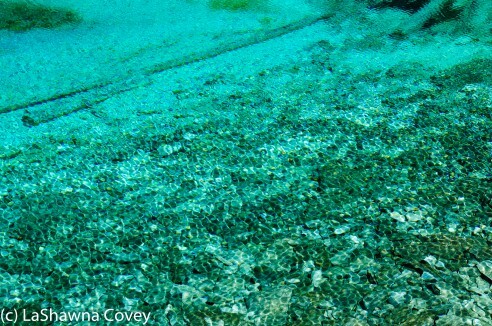 Sometimes I am particularly attracted to something unique and beautiful in general, and sometimes I want to visit some place to experience something very specific. 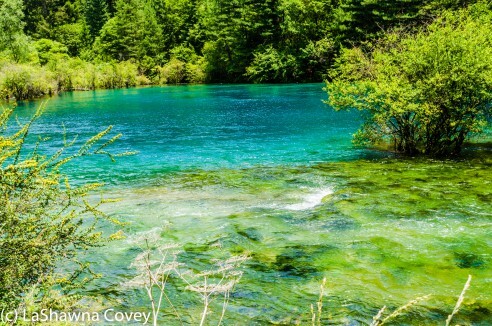 In the case of Jiuzhaigou National Park in China, I had never heard of this place until about a year and a half ago. Then I stumbled upon this website that showed off some of the most surreal places on this Earth, both natural and man made. I was instantly intrigued by the pictures I saw. 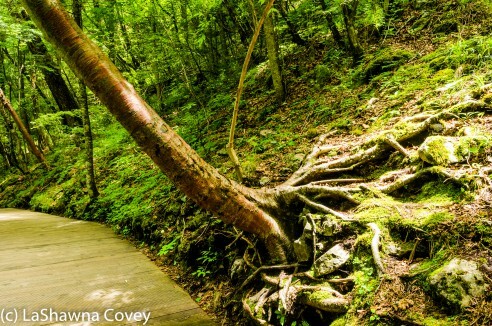 They were unlike anything I’ve seen before and I very much wanted to visit the place. I mean, this looked like a magical fairy land filled with lakes the colors of jewel tones, strange and beautiful waterfalls, and reflections on the water like mirrors. Lucky for me that I currently live in Korea, so it’s not THAT difficult to travel to Jiuzhaigou National Park (though it still takes more work to get to than some place like Beijing or Shanghai). After some basic research in my guide book and on the national park website, I started planning on when I could make my visit. My first desire was to visit in the fall. 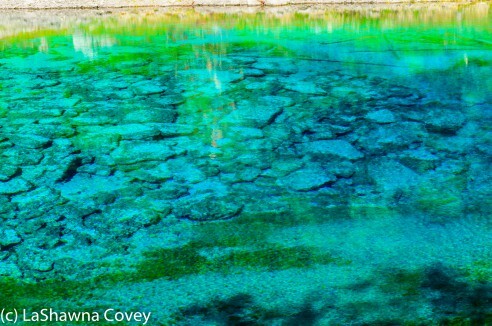 Autumn is supposed to be the most beautiful time of the year to visit Jiuzhaigou, and I’ve seen the pictures to prove it. However, the park’s gorgeousness is not exactly a secret, so it’s also the most crowded time of the year. There are no direct flights from Seoul to Jiuzhaigou, so at best you have to take a hop through Beijing, Shanghai or Chengdu. I started looking for flights about 60 days out, and much to my amazement, all the direct flights from Beijing and Shanghai were booked, so it would have taken me around 24 hours, and at least two stops, to get to Jiuzhaigou. I decided to put my travel desires on hold, but when I had the opportunity to go on vacation in early July, I figured this was my last, best chance to see Jiuzhaigou before I leave Korea was then. I started planning this trip nearly 90 days out, and luckily for me, there were flights available, and all I had to worry about was one layover on Beijing on the way there, and a stop in Chengdu on the return. 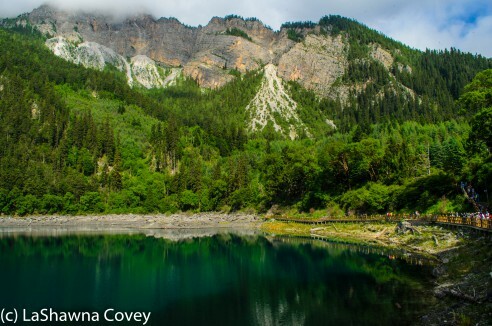 I planned for four full days in Jiuzhaigou to give me maximum time to visit the park. Most things I read suggested a minimum two days to see all three valleys. 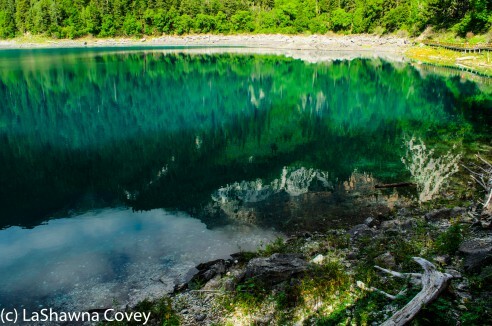 The nearby Huanglong Scenic Area was also high on the list of must do sightseeing areas, and upon further research, I decided a day trip to the Fairy Pond Scenic Area would also be worthwhile. This itinerary allowed me to see everything I wanted to see without rushing, and allowed me to the time to really savor the gorgeous beauty. 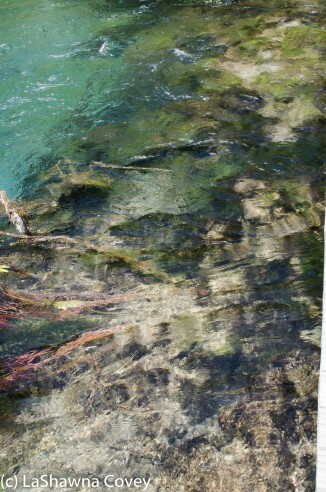 I knew before I went that July is not the best time to visit Jiuzhaigou. Sure, it is the greenest time of the year, but that is because it is also the rainiest. I knew this going in, and I hoped for good weather. For the most part, the weather actually held out. Sure, there was some cloudiness at times, but for the most part, I couldn’t ask for better weather. This park is pretty regardless of the weather, but it is exceptionally gorgeous and surreal when it is sunny out. 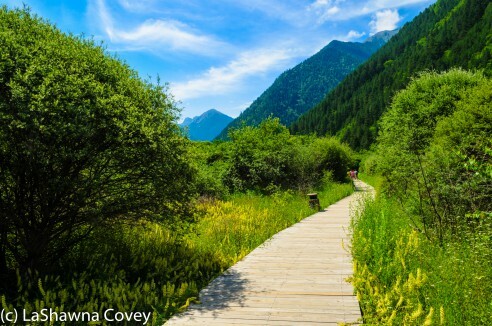 The Jiuzhaigou National Park and surroundings are well established for tourist visits, though in some respects, things are easier if you are fluent or at least familiar with Mandarin. However, if you are like me, and completely clueless when it comes to the local language, you can still prevail and enjoy yourself. Considering that Jiuzhaigou is a small area and is in a very isolated part of China, the modernness of the airport and many of the villages is a tad surprising (though probably not when considering this area is very much about attracting tourists). 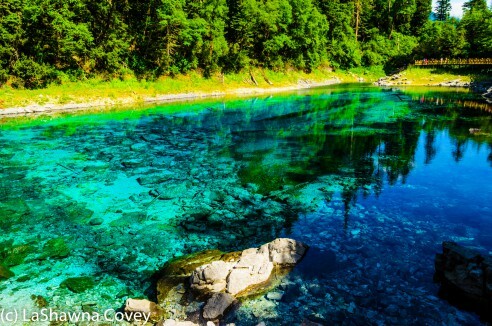 There are a couple dozen flights a day to and from Jiuzhaigou from around China. 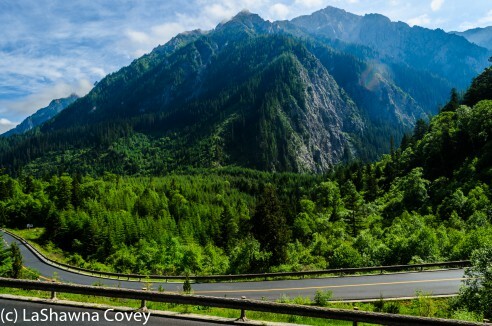 The airport is about a 90-120 minute ride from Jiuzhaigou village. 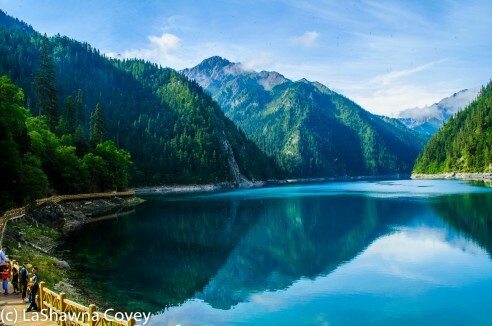 If you travel to the area independently, your two choices to get to Jiuzhaigou are bus or taxi. A bus trip is only about 45 yuan, but the schedule is erratic, isn’t posted, and doesn’t seem to run in the evening. Since I arrived around 1900, that left the only option as taxi, of which there are numerous ones. Now granted, none of the taxi drivers speak English from what I saw (or very minimal English), so you have to use gestures and broken phrases to negotiate. The flat fee per taxi is about 300 yuan. That is the same fee if you are by yourself or if you were with other people. Luckily for me, I arrived with two Europeans who also needed to get to Jiuzhaigou and we agreed to split the cab, so I ended up only spending 100 yuan. 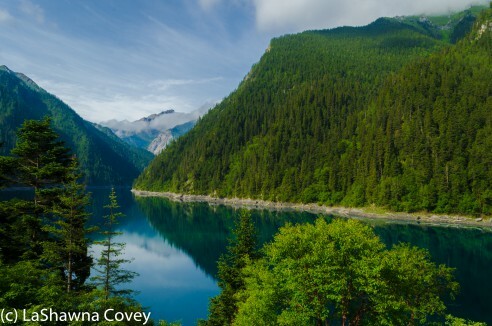 There are a wide variety of accommodations in Jiuzhaigou, from really low budget hotels, to the five star Sheraton resort. However, most of the accommodations available for online booking tend to fall at the higher end of the spectrum. I was tempted to stay at the Sheraton resort, because it looked really nice, but the cost was around twice as high as the next most expensive hotel. I elected to stay at the Qian He International Hotel, which is located very near the Sheraton, and approximately 1500 meters from the entrance of Jiuzhaigou National Park. Overall, the hotel received good reviews, though I was a bit leery of the fact that nobody on the staff was supposed to speak English, and the hotel only accepted cash, and not credit cards. However, I was very pleasantly surprised when I showed up that the hotel now does take credit cards, which is much better than carrying hundreds of US dollars in local currency around. And yeah, nobody really spoke fluent English on staff, but the staff was very helpful, and the assistant manager in particular went out of her way to assist me using translation software. The hotel itself is very nice and upscale, and I really loved the bathrooms in particular. Breakfast buffet is included in the room price. I wasn’t surprised since many of the reviews talked about how the buffet is geared to Chinese tastes. But there is plenty of options, and it’s all you can eat, and you can never go wrong there. Another interesting thing is how much of an early riser the hotel (and presumably all of the hotels) is. Breakfast opened at 0630, and at most hotels, I would have been completely alone when I was up. Here though, there was a line that formed outside of the breakfast room and the room was swarmed as soon as the door opened. In fact, everywhere I went (outside of my hotel room), I encountered swarms of people. China itself is heavily populated, and Jiuzhaigou is a very popular area, so there were crowds of people everywhere. I am not exactly a people person, and crowds of people make me even more antsy, but it’s just one of those things you have to accept when visiting the area. 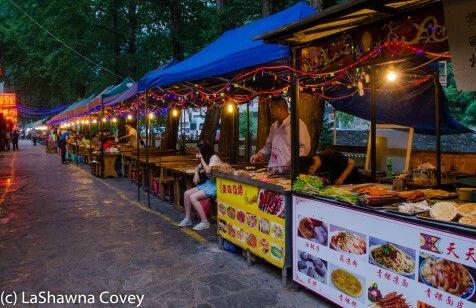 Jiuzhaigou is a tourist area, and most of the places to eat are either hotels or one of the many restaurants that line the river. Qian He International Hotel is located only 1500 meters away from the park entrance, and the walk to and from the hotel was very pleasant and cool along the river. There are so many small restaurants that all you have to do is pick one that interests you and enjoy. My two basic criteria for restaurant selection was an English menu and tasty looking food. I may be a somewhat adventurous local eater at times, but I do draw the line at picking something at random, without even so much as a picture. But the restaurants I chose had rather tasty dishes. 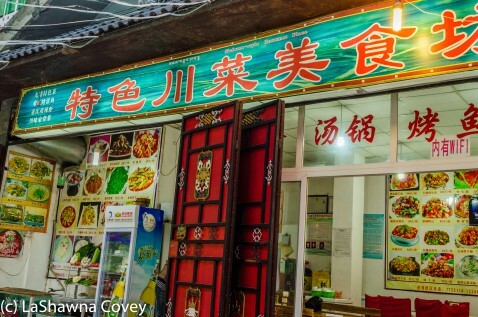 The first night I had shredded pork with green peppers, fried rice, and spiced yak meat. Yes, yak meat. I have to say that was the first time for that, but it was rather tasty. I guess sort of like beef, or maybe closer to deer. The second night, my choice wasn’t quite so well received. 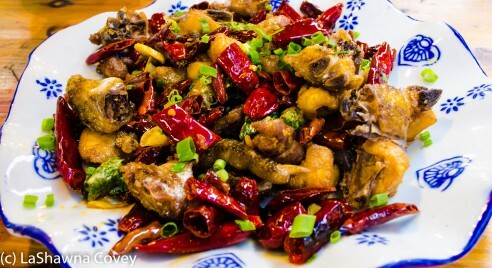 I ordered spicy chicken, forgetting for a moment that in China, anything spicy tends to come covered in red chili peppers. And in this case, the chicken was certainly what I am used to in Chinese restaurants at home. It was more chicken parts with bone, and even claws still in the dinner (needless to say, I didn’t eat the claws). I’ll cover more specifics about visiting the park and the surrounding areas in coming blog posts. This post was more designed as an overview to visiting the area. 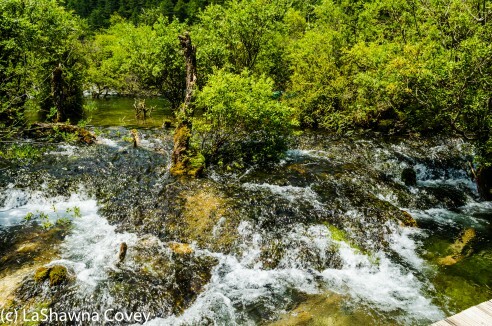 I will say that if you love beautiful nature, and want to see unique places in this world, Jiuzhaigou National Park should definitely be on your “to do” list. This entry was posted in Food, Photography, Travel and tagged beautiful nature, China, Jiuzhai Valley National Park, Jiuzhaigou National Park, Qian He International Hotel, surreal nature. it’s really helpful..im planning to travel to seoul first then jiuzhaigou. any information which airline took u to jiuzhaigou. im headache doing the search😆thankU&regards! I believe I flew Air China from Seoul. I had to fly from Seoul to Beijing and then another flight to Jiuzhaigou. I would recommend going through a travel agent if you have no luck with online ticket purchases (I had some difficulty booking a flight to Jiuzhaigou). There are flights from Beijing every day. Many many flights from Chengdu, and I think the occasional flight from Shanghai.